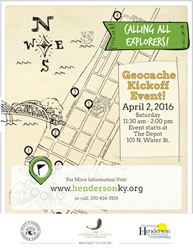 The Henderson County Tourist Commission is partnering with the City of Henderson and the Downtown Henderson Partnership to sponsor a free Geocache Kickoff Event taking place Saturday, April 2, 2016. The family-friendly event kicks off the addition of a new geocaching trail, a scavenger hunt comprised of twelve hiding spots located throughout downtown Henderson. Check-in for this free event starts at 11:30 a.m. in Audubon Mill Park. Light refreshments will be provided and door prizes will be selected at 1:00 p.m. and 2:00 p.m. All geocache locations are within walking distance of each other; the total radius of the trail extends about a mile and a half. Each participant will receive a passport and map and are encouraged to download the free “Geocaching” app on their mobile device, which will assist participants to locate the cache containers using GPS coordinates. As participants find each hidden geocache, they will sign their name in the logbook in each cache container, and mark their passport with the corresponding stencil inside each cache container. After finishing the trail and completing their passport, participants will return back to the Henderson County Tourist Commission to receive a commemorative coin. Though the event ends at 2:00 p.m., the containers will remain outdoors and the geocaching activity will remain available year-round. Participants can pick up a passport from the Tourist Commission Monday-Friday between 9:00 a.m. and 5:00 p.m.
For questions, please contact the Tourist Commission at (270) 826-3128, 1-800-648-3128 or at info(at)hendersonky(dot)org.